Even as the boundaries that separate the age-old and emerging cultures of our world seem to meld and coalesce, there are musicians who rely on what has gone before them to craft entirely new styles of music that are much more than hybrids, that are, in essence, newly created genres which raise the bar for generations of artists to come. Maeve Gilchrist is such an artist. A harpist, vocalist, and classically trained pianist, Maeve - who is daughter to an Irish mother and Scottish father - grew up equally immersed in the traditional music of her Celtic ancestors. From her early teens, Maeve was an in-demand member on the traditional music scene in Scotland where she performed at events such as the opening of the Scottish Parliament, the Celtic Connections Festival and the International Edinburgh Harp Festival. But it was her move to Boston, where she studied world music and jazz at Berklee, that set her on a musical path that has now reached its culmination in Song of Delight, her debut for Adventure Music America, which will be released on May 17. 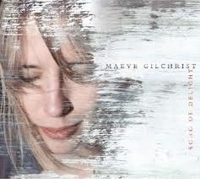 On Song of Delight, which is the second release of Maeve's career, she has managed to both reflect the deep roots of her traditional background and yet branch out in a distinctive direction that is singularly of her own design. It was with all of those influences and inspirations that Maeve arrived at Boston’s Berklee College of Music, where she was enrolled as a jazz vocal major. Attending a school that placed equal emphasis on the business of music as well as its craft, Maeve soon realized that the key to a successful career lay in identifying and nurturing the qualities that set her apart. The answer, to Maeve, lay equally in what she’d brought to Boston as well as what she was able to take away from her time there. Fast forward a bit, and Maeve found herself living in Portland, Maine. In the year since the release of Reaching Me, she’d been teaching and performing throughout the Northeast, and was among the winners at the prestigious Lyon and Healy International Jazz and Pop Harpfest competition. At a party, a friend introduced her to string legend Darol Anger, a chance meeting that proved rather fortuitous a few months later, when Maeve decided it was time to record her second CD, and asked Darol if he’d be interested in participating. The result of that musical association, recorded in Maine, produced by Anger, and made more magical with the contributions of string bassist (and Maeve’s frequent collaborator) Aidan O’Donnell, is Maeve’s Adventure Music America debut, Song of Delight. Also on the CD are cellist Mike Block, and Anger, with guest performances from violinist Hannah Reed and mandolin player Joe Walsh. In addition to her own recordings and performances, Maeve’s talents have led her to collaborations with a wide variety of acclaimed contemporary artists, including Kathy Mattea and Grammy Award-winning bassist, Esperanza Spalding.